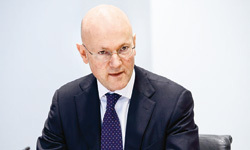 At the Swiss Re Investors’ Day in December 2015, the Corporate Solutions CEO presented the strategic initiatives for growth beyond 2015, communicating the intent to focus on further expansion into primary lead and to broaden the footprint. In 2015, Corporate Solutions developed primary lead capabilities and rolled out primary lead products in additional markets across all regions. In addition, Corporate Solutions started operations in Johannesburg, Madrid, Melbourne, and Osaka, expanding the distribution network to 52 offices in 20 countries. In January 2016, Corporate Solutions announced the agreement to acquire a leading US employer stop loss underwriter, IHC Risk Solutions, LLC, subject to regulatory approval. The transaction includes IHC Risk Solutions’ operations, its team of experts and business portfolio, including in-force, new and renewal business written with IHC subsidiaries. This acquisition will broaden Corporate Solutions current employer stop loss capabilities in the small- and middle-market self-funded healthcare benefits segment. Net income was USD 340 million in 2015, an increase of 6.6% compared to USD 319 million in 2014. The 2015 result was driven by continued profitable business performance across most lines of business and investment activities. Net premiums were USD 3.4 billion in 2015, a decrease of 1.9% compared to 2014, driven by the challenging market, most notably in property in North America and Latin America, and foreign exchange rate movements. At constant exchange rates, net premiums increased by 1.7%. Gross premiums written and premiums for insurance in derivative form, net of internal fronting for the Reinsurance Business Unit, decreased 7.9%, or 4.3% at constant exchange rates, to USD 3.9 billion in 2015 compared to USD 4.2 billion in 2014. The combined ratio increased by 0.8 percentage point to 93.8% in 2015 compared to 93.0% in 2014, impacted by higher large man-made losses and higher expenses as a result of investment in long-term growth. The quality of the book remained consistently high year on year, with better than expected natural catastrophe experience. The property combined ratio for 2015 improved by 4.1 percentage points to 77.0%, reflecting continued profitable business performance in most regions and lower large loss frequency compared to 2014. Both periods benefited from the absence of major natural catastrophe losses. The casualty combined ratio improved by 6.6 percentage points to 104.1% in 2015, mainly due to successful business growth and favourable prior-year development on liability business in North America, partially offset by two large man-made losses. The credit combined ratio increased to 91.1% in 2015 compared to 72.3% in 2014, driven by large surety losses in Latin America and Asia. In other specialty lines, the combined ratio deteriorated by 9.6 percentage points to 110.2% in 2015, mainly due to large aviation and satellite losses. The return on investments for 2015 was 3.0% compared to 2.6% in 2014, reflecting an increase in the net investment income of USD 36 million and net realised gains of USD 13 million. Net investment income increased to USD 149 million in 2015 compared to USD 113 million in 2014, in part due to business growth and an ensuing increase in the investment portfolio. Net realised gains were USD 107 million in 2015 compared to USD 94 million in 2014, as the current year included additional net realised gains on sales of equity securities. Insurance-related derivative results are not included in the investment figures above. Corporate Solutions offers insurance protection against weather perils and other risks, which are accounted for as derivatives. The insurance in derivative form reported net realised gains of USD 33 million in 2015 compared to USD 53 million in 2014. The 2015 period was impacted by mild weather in December. Common shareholdersʼ equity remained stable at USD 2.3 billion since the end of 2014, with a USD 200 million dividend paid to the Group, offset by net income for the year. The return on equity was 14.8% in 2015, compared to 12.5% in 2014. Prices for commercial insurance are under significant pressure, with a growing number of segments operating at unattractive rate levels. Corporate Solutions has maintained its commitment to underwriting discipline while achieving its return on equity ambition for 2015. Corporate Solutions believes that it is well positioned to successfully navigate an increasingly challenging market thanks to its value proposition, strong balance sheet and selective underwriting approach, but is not fully insulated from the general market environment.